This is an excerpt from an article in the upcoming NEWSLETTER To read the full article, please become a member. 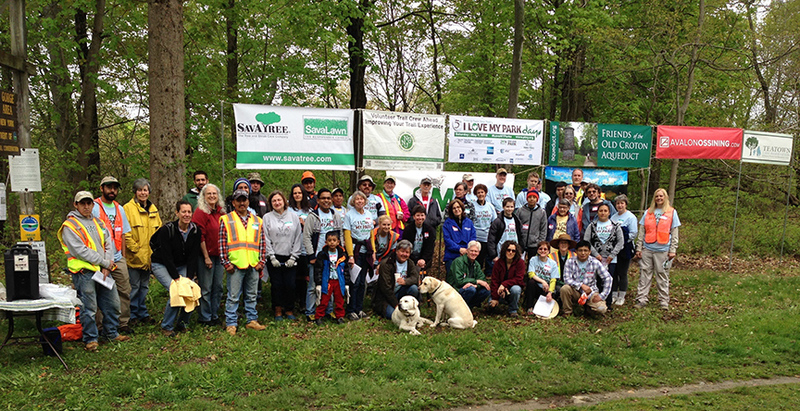 56 volunteers worked for a total of 225 hours on 1.5 miles of the northern section of the trail in which numerous invasive plants and bushes were removed and chipped and/or mowed; 25 bags of garlic mustard pulled and a small truck load of large items of trash were removed from a hillside. 10 valuable native trees were preserved by removing invasive vines from them and a historic stone wall was cleared of invasive plants and then repaired and completely restored. Last year Daria adopted an 800 ft. section of the OCA near her house in Ossining, inspired to restore it to some form of its previous natural beauty. She had participated in the annual ILMPD days and embarked on a course of study including taking invasive identification and mapping classes offered by the NY-NJ Trail Conference and learning about removal techniques from her work volunteering at the New York Botanical Garden. In 2015 she started a long term project to use her knowledge to improve the trail with approval and support from State Parks. In 2016 she continued her work with a volunteer Friends’ member Glenn Sungela and also hired local laborers to help. She focused on removing vines which were overwhelming the area and smothering trees: cutting and pulling them and digging out the large underground roots. She expanded her efforts to include bushes and plants, experimenting with various suppression techniques including black plastic, cardboard and mountains of wood chips. She has started a plant nursery with the goal of replacing the invasive plants with valuable natives suited to the area. A challenge has been to address the plants that spread to neighboring properties as well as those migrating from local properties onto the trail. In 2016 over 190 hours were devoted to this project. Three volunteers (two Friends members and one State Parks intern,) continued the mapping of invasive plants on the Aqueduct that was begun in 2014. They walked the trail using hand held GPS devices, documenting the location and frequency of a list of twenty-four invasive species and added Kudzu and bamboo to the list. Between the three of them they spent 121 hours doing the documentation, covering 7.2 miles. When the last section is completed next season, the entire 26 miles of the Aqueduct will have been mapped. The Friends engaged this group of four energetic, enthusiastic and effective members of the NY – NJ Trail Conference’s Invasive Strike Force Conservation Crew to work on the trail from June 16 through June 19. They removed invasive plants and bushes on 3.022 acres of the trail about a mile south of the Croton Dam. They removed 6,966 invasive plants and bushes (they kept count!) with the help of 11 volunteers. Many of the plants removed were those that had been located and targeted by the mapping project. That section of the trail is now visibly different and, since they used best management practices in their removal techniques and were able to apply herbicides to the cut stumps, we do not expect those plants to return! The native plants, bushes and trees in that area now have an improved chance of thriving. We will monitor and continue to remediate this area going forward. The mapping project also revealed significant infestations of Kudzu, a highly invasive vine that has only recently arrived in Westchester and threatens to overwhelm entire sections of the trail if not controlled. As a result, an emergency request went out to the State Parks Invasive Strike Force (ISF) which was already scheduled to work in the Taconic Region of State Parks this fall. The four person team was immediately deployed to work on the Trail in Yonkers, where they worked for five days in 10 hour shifts removing as much of the infestations as they could. State Parks then funded a day of herbicide treatment provided by Trillium I S M, Inc. Thomas Lewis from Trillium, along with his apprentice, worked for a full day treating three areas on the trail in Yonkers: just north of the NYC border, Lamartine Avenue and Rudolph Terrace. Our mapping team of Friends’ members Shaun Gorman and his wife Ilona Fabian provided invaluable assistance to the ISF and to Trillium, providing them with the GPS coordinates and photographs and meeting them on site to provide directions and support. The staff of the Department of Environmental Conservation (DEC) was contacted and provided with the information gleaned by the mapping. The DEC provided guidance on mitigation techniques and may be able to assist with additional removal efforts next season. They had already been aware of an infestation in Hastings and on September 21 treated two areas on the trail in Hastings which they had previously treated in addition to an infestation of Kudzu on the trail near Warburton Avenue. Those who owned property next to the affected areas were informed of the Trillium and DEC treatments; work will need to be done going forward to encourage them to participate in mitigation efforts, since the Kudzu does not respect property boundaries. Daria Gregg spent $2,800 for labor and $350 for materials to support her work. The expenses incurred by the Friends to support ILMPD and the Invasive Strike Force Conservation Crew amounted to $4,670, of which $3,400 were covered by targeted donations. We look forward to continued support of such efforts in the coming years.